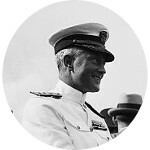 Who was Admiral Richard Byrd? Richard Evelyn Byrd was an American Rear Admiral who was a pioneer aviator and polar explorer. He claimed that his polar expeditions were the first to reach both the North Pole and South Pole by air. A claim later debated by polar and aviation experts. In 1927 he flew across the Atlantic Ocean from New York to Paris having been beaten by Charles Lindbergh by only one month. He received both the Distinguished Flying Cross and the Medal of Honor for his exploits. Admiral Richard Byrd has a large number of famous kin mainly due to his prominent colonial Virginia ancestors. One of the most interesting connections is that he is a direct descendant of Virginia Planter John Rolfe and his wife Pocahontas. Richard Byrd has a number of presidential and royal kinships that include but are not limited to George Washington, both Harrisons, John Tyler, and Princess Diana. He also has a rather close connection to General Robert E. Lee.